Make this “fried rice” recipe without rice using cauliflower as the “rice component.” This recipe’s secret ingredient is sun-dried tomato dressing, adding a bit of zing to tantalize those taste buds. Use pulsing action of food processor to process half the cauliflower into 1/4-inch pieces. (Do not process until smooth.) Spoon into medium bowl. Repeat with remaining cauliflower. Heat 1/4 cup dressing in large nonstick skillet on medium-high heat. Add carrots; cook 2 min., stirring frequently. Add chicken; cook and stir 3 min. or until no longer pink. Add cauliflower and water; cook 5 min. or until cauliflower is crisp-tender, stirring constantly. Stir in peas; cook and stir 2 min. or until heated through. Add remaining dressing and onions; mix well. Substitute boneless pork tenderloin for the chicken. For added flavour, serve with lemon wedges. 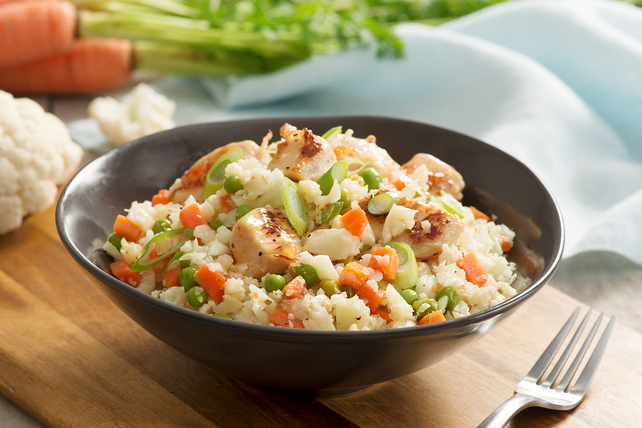 Cauliflower makes a great rice substitute in this delicious dish. It also helps make each serving high in fibre and an excellent source of vitamin C.